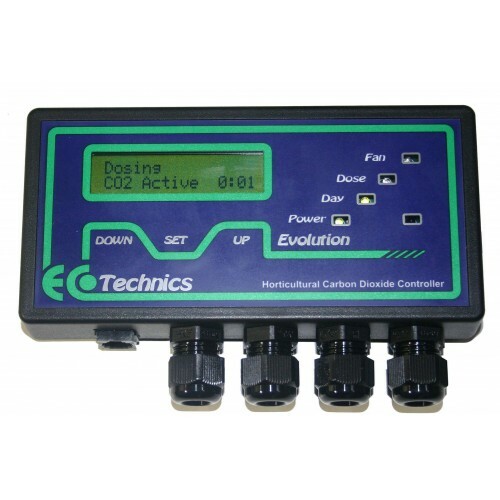 The Ecotecnics Evolution CO2 Controller monitors CO2 Levels within the grow room and constantly adjusts the amount of C02 to maintain ideal conditions for optimal plant growth. This unit is also compatible with the Evolution Digital Fan Speed Controller. The Evolution controller utilizes the latest microprocessor and infra-red technology to monitor & control the levels of carbon dioxide in your growing area. The controller can operate with or with the optional Evolution Solid State NDIR CO2 sensor, this controller can also be used with either bottled CO2 gas or with a propane or natural gas burning CO2 generator, in addition to this the Evolution controller can be interfaced to most external thermo / hygrostats for Improved environmental control. • The CO2 Regulator is really simple to set up and use.• Full 1 year warranty.Carbon Dio..